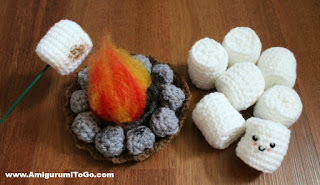 I first made a marshmallow for my fire breathing dragons to have as a treat. Soon after posting the photo of them enjoying a marshmallow I knew I had to write up the pattern for it so your dragon can have one too! However, you might not have a dragon and maybe don't even want a dragon but do want to "roast" some amigurumi marshmallows? In that case, I came up with the fire pit for you to do just that. I hope you enjoy! f/o leaving a tail for sewing. Weave in and out of the FLO then stuff and shape. Pull yarn tail to close the gap. 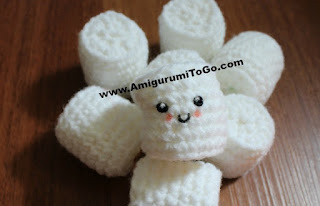 Carry the yarn tail through the center and out the other end then go back into the marshmallow, (go over a bit, don't go back through where you came out), through the center and out the other end. Tug on the yarn tail to pull the ends of the marshmallow together just slightly, this will help hold the shape. Once you're happy with how it looks, knot off and hide the yarn tail inside the marshmallow. 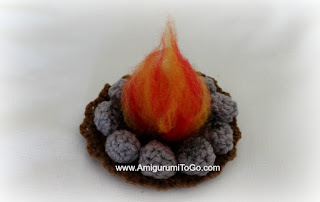 You can add a bit of color by dipping your finger tip into brown paint and very lightly dust the marshmallow in one area to make it look just like it does when it's starting to cook from the fire. I didn't feel it necessary to add a face but did so on one for those who would like to see a face. I used black paint to dot the eyes in, dotted a tiny bit of white to those. I also painted the mouth and cheek color on. f/o and weave in yarn tail. Stretch the piece out. 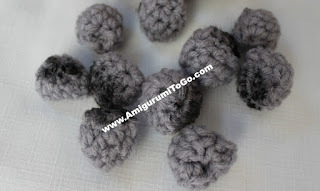 The part where you crocheted in the BLO should easily fold upwards creating a basket type bottom. 5) 1sc in the BLO for 1 row. f/o leaving a tail for sewing. Use this yarn tail to sew the ashes to the ground. 4) sc2tog twice, stuff rock with yarn or stuffing, it won't take much of either. Then sl st across and then again to close up the gap. (The rocks are not meant to be perfect round balls) f/o and hide yarn tail inside rock. You can add color to the side of the rocks that will face the fire by dipping your finger into black paint and rubbing it on the surface of the rock. wrap orange, yellow, and red strands of yarn together around your hand about 6 times, drop the orange and red and wrap the yellow about 3 more times. Cut free, take the loop of strands off your hand and cut through the middle of the loop. Hold one end very tight and brush the other end. Once you have the strands completely brushed out, turn it around and brush the other end. Tie off center and sew to the middle of the ashes. Sorry for the terrible photos of the fire. I took them from my video. If you need a better understanding of what I explained here, I do have a video for making this fire, click here. Watch it only up to where you tie it off in the center. 1) sew the fire to the middle of the ashes. Pull the yarn tight when you knot off to help the fire stand straight up. Now sew the ashes to the center of the ground. 2) assemble the rocks. You can sew these in place. I prefer hot glue though, much quicker. You can also leave them as they are and just assemble them each time for play. Wow! I love it! I'm still working on Dreams but think I will do the marshmallow and pit before adding Nightmare. You know..... So Dreams has something to eat! This is amazingly creative, I love it! Can't wait to start work on some dragons of my own <3 Thank you for coming up with these patterns.